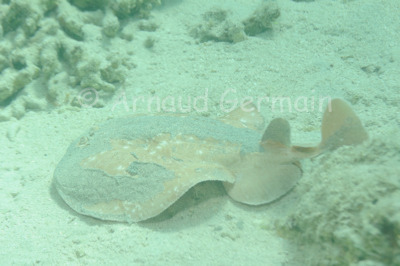 I saw this torpedo ray, or electric ray as I was exiting Marsa Shagra bay. I had been taking pictures of students from my school under water and was at the back of the group. Suddenly, I saw this ray swimming. I went quickly and carefully approached. These fish can send very nasty electric shocks, the way they use to subdue their prey. I managed 3 shots before the ray buried itself in the sand. Nikon D700, Nikon 28-105 mm macro at 105mm, F9, 1/250th, ISO 400, Ikelite Housing and Ikelite DS160 strobe set on TTL. Marsa Shagra Bay, about 2 metres down, Marsa Alam, Egypt.